Welcome to yet another Freezer Meal Friday. I'm Chef Stephanie Petersen for those just joining us. Every Friday I host a freezer meal idea. This week, we have six. Yes. Six. I couldn't figure out how to break it up without losing the amazing effect of what you can accomplish in a short time. A house divided against itself cannot stand. That cannot be said about casserole. If you served the same flavorless casserole every week to your family, week in and week out, would they eventually get so bored they would start punting hot chunks of molten sauce drenched casserole across the dining room table in protest? Not today. I joined my darling friend Lisa for an Evil Think Tank freezer meal session to see if a Chicken Divan recipe could be made into several different varieties of casserole. The recipe we divided was actually so bland that it may be one of the best classic examples of plain American food I've ever seen. Right up there with milk toast. Granny eats milk toast. Yeah, that's all I have to say about that. Lisa opened up her kitchen. She had the main ingredients for the original recipe and we raided the fridge and pantry to create the rest. That is what we do at an Evil Think Tank...we use what we have and we create. Needless to say, this ensuing brilliance was a welcome change. Six casseroles...all very different and all very flavorful. Not bad for a couple hours in the kitchen. Am I right? We used microwave safe containers since Lisa wanted to just be able to pop them in her micro to cook them. It is fine to use freezer safe casserole pans if you want to bake the casseroles in the oven as well. Might I also suggest if you are making the smaller size casseroles for a family of 2 adults with one or two small children to use loaf pans. Those work perfectly. So...let the wild rumpus start. I brought organic herbs from my garden. Thyme, basil, oregano, dill, parsley and tarragon. If your family won't eat fresh green stuff like this, by all means use dry...but use something. Chop the herbs separately. I placed them in separate containers to keep a little order. Lisa boiled the chicken breast until they where cooked through and no longer pink. About 35 minutes on high, covered in water or chicken stock. Chop the chicken into chunks and season well with salt, pepper, granulated garlic and onion or Chef Tess All Purpose Seasoning. Line up your casserole dishes. Six or twelve depending on the size of your family. Lisa decided we needed to label each casseroles so we didn't get confused about what went where. Divide the frozen broccoli between the casserole dishes. In one of the dishes add the mixed Italian veggies and bell peppers (see top middle?). Divide the sauteed mushroom in half and add them to two of the plain broccoli pans as well. Divide the chicken between the six casseroles. The frozen veggies help keep that chicken cool while you make the sauce and add your flavor ingredients. You want them cold. I promise. We made two different base sauces. One based on chicken stock and one based on milk. I prefer to make my own so I can control the ingredients, but also so I can control the cost. It's much cheaper than buying prepared gravy jars. However, if you do buy the jars, make sure it is low sodium. Let's make the sauce. You will need two half gallon sauce pans. In the bottom of each pan melt 1/4 cup butter over medium heat. When melted add 1/4 cup flour to each pan and whisk well. It will be the consistency of loose wet sand. Cook this butter and flour mixture, called a roux, for 3-5 minutes stirring constantly. This cooks some of the start out of the flour and make you sauce have a smooth velvet texture. Pour 4 cups milk into one pan and 4 cups stock into the other. Stir constantly to avoid lump. Lisa is good at gravy mixing. Isn't she cute? Smoooches Lisa! Each sauce pot gets one bay leaf, 1tsp granulated garlic, onion and 1/2 tsp pepper. I also add a hint...just a breath...of ground clove to the sauces. Not too much or it will taste like Christmas pudding sauce instead of a nice subtle hint of happiness. Simmer on low heat stirring every few minutes so the sauce doesn't burn. It needs to cook 15-20 minutes. This gives you time to add all the flavor agents to the casserole pans. When sauce is cooked, divide each sauce into 3 containers. This will give you 3 milk sauces and 3 chicken sauces 1 1/3 cup each. Add 1 tsp curry powder and 1/2 tsp black pepper to one of the chicken sauces. Stir well. Oh...and if you find that dang bay leaf, take it out. If you don't the sauce will be overpowered by bay. To one of the plain broccoli chicken casseroles, add raisins and pineapple. Top with curry sauce and ease the sauce into the casserole. To one of the broccoli, chicken and mushroom casseroles, add half the can of black beans. To one of the chicken sauces add 2T peanut butter, 2T soy sauce, 1 tsp granulated garlic, 1/2 tsp ground ginger, and 2-3 tsp hot sauce. Mix well. Add to the chicken and black bean casserole. To one of the plain chicken and broccoli casseroles, add cooked sausage and the other half of the black beans. Top with half the can of diced tomatoes (we used marinated tomatoes). Add a tablespoon of fresh oregano, sprinkled over the casserole. To the last chicken sauce, add 2-3 Tablespoons chopped chipotles or green chiles and 1 tsp fajita or taco seasoning. Savory Buffalo Chicken and Bacon Casserole. Add 1/2 lb of cooked bacon to one of the plain chicken and broccoli casseroles. Sprinkle with 2T fresh chopped parsley if desired. For the sauce, use one of the milk sauces. Because we used 3T of hot sauce that contains vinegar in it, we had to do something to keep the vinegar from curdling the milk sauce. 1/8 tsp baking soda will neutralize the acid without changing the flavor of the sauce. We also wanted the sauce to taste like buffalo with ranch dressing and celery so we added 1/4 tsp celery seed, 1 tsp onion granules, 1 tsp garlic granules and 1T chopped parsley. The acid will react to the soda a bit by bubbling. Don't worry, it won't overflow like that science project valcano you made in third grade. Pour the sauce over the bacon and chicken casserole. Top with half the grated Monterey Jack cheese. Add 2-3T fresh basil pesto and 1 tsp fresh cracked pepper and 1 tsp chef tess Romantic Italian seasoning to a milk sauce. Pour over the casserole and work it into the ingredients a bit. You can top with mozzarella cheese if desired (we didn't have any on hand). To the last casserole with mushrooms, broccoli and chicken add the second half of the cooked bacon. Sprinkle with 1T each fresh chopped French herbs: Tarragon, parsley, basil, thyme and dill (if you use the dry herbs use 1 1/2 tsp each). For the sauce take the last portion of milk sauce and add 2tsp dry mustard and 1/2 tsp white pepper. Pour over casserole and work into the ingredients a bit. Once combined, top with the last half of the cheese. You now have six casseroles. All six are now ready to bag and freeze. Some had lids that came with the containers. Remove from the freezer and defrost in the fridge overnight (or defrost out of the bag using the defrost setting of the microwave). Microwave uncovered on high 13-15 minutes until hot. 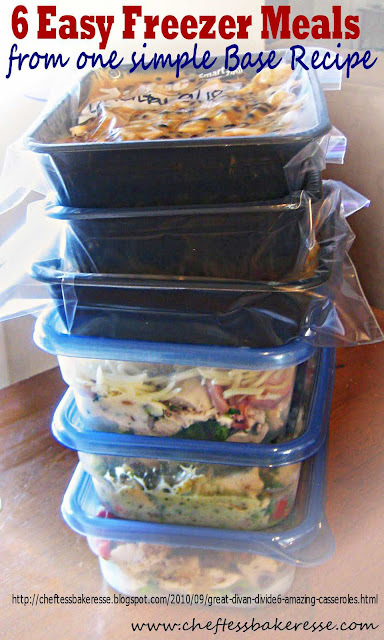 Oven: Heat defrosted casserole in oven safe containers, covered, 375 degrees 35-40 minutes and uncover last 5 minutes. There you go. Six to twelve freezer meals are now yours. Enjoy my friends. END note: Auntie Em has made this blog entry into a lovely pdf. If you would like a copy, feel free to email me chef-tess@hotmail.com and I can get that to you for free! Thanks! Thank you- this is amazing. These all look really good! You have me tempted to try them. Great recipes and ideas. Thanks so much. I will be making these this week. A wonderful time saver for around the holidays when everyone is busy making cakes and cookies and have no time to make dinner. Impressive! I have a request however; can you provide a printer-friendly version of this post? With 3 boys in the house (husband, 6 and 3 yr olds) I am anxious to fill up my freezer with these casseroles for the fall. All the recipes look so good. I need to start making some freezer meals to get ready for when baby comes. I was thinking the same thing- a printer friendly version at the end would be wonderful! Looks good. Please provide a printer friendly link. I am so hungry. Yum. It may take me a while to get a printer friendly version. It's a crazy couple of weeks upcoming. I'll see what I can do in that regard though. Smoooches everyone. Steph, I can put a tutorial together on Mon or Tues...once I get to work and can use their Word tools. Then you can put a link to the pdf, right? or you can e-mail those that have requested it. Let me know! BTW, these look amazing! I'm definately going to make them ALL. Great job! These look amazing, and I will definitely be trying them. For the white sauce, heat the milk in the microwave first, and the sauce cooks a lot faster. Don't heat to boiling though - you don't want skin to form on top. I see pasta in a couple of the finished casseroles, but no pasta listed in ingredient list. Are these to be cooked and added before freezing or added after thawing? Are other starches added to any of the others? I think you're seeing the fresh shredded mozzarella cheese. These are lower carb based meals. before we were gluten free, I often made a roux for gravy, but what type of flour do you use to make a roux now? I'd use rice flour or Ultra Gel without making it a roux. 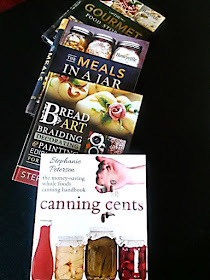 If you go to my section on 5 money saving recipes every cook should know, there is information on gluten-free sauces that are easy and inexpensive.